If you only see one Bollywood film ... make it Sholay. Sholay ("Flames") is a film that deserves a full review. This 1975 film that is a true classic of Hindi cinema. I’ve been told that, at least for a while, it held the title of longest continuously running film in India. It features a sparkling and immensely popular soundtrack by R.D. Burman, a favorite composer of mine, who was an absolute genius at fusing funky Western pop sounds with traditional Indian rhythm and melody. (He was also Asha Bhosle’s husband.) And it also features a terrific cast, headed up by Amitabh Bachchan, Hindi film’s biggest hero of the 70s, in his seminal “Angry Young Man” role. Sholay is sometimes called the first “curry western,” a parallel to the term “spaghetti western,” as it ushered in a spate of cowboy-type films. Sholay includes countless references to contemporary American westerns like Once Upon a Time in America and The Good, the Bad, and the Ugly. But independent from these homages (some would say rip-offs), Sholay stands on its own as a truly wonderful piece of film-making – one of the four or five best Hindi films I have ever seen. Sholay tells the tale of two career crooks Jai and Veeru (Amitabh Bachchan and 70s heartthrob Dharmendra) pressed into service by a retired police officer and landowner (Sanjeev Kumar) to flush out a local thug, Gabbar Singh (Amjad Khan) who is terrorizing the villagers with his peculiarly sadistic brand of extortion and banditry. Arriving in the village, Veeru immediately falls madly in love with the chatty, effervescent carriage-driver Basanti (played adorably by Hema Malini) while Jai is quietly, broodingly taken with Radha, a sad, silent widow who lives in the landowner’s household. 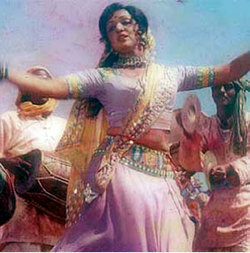 (Radha is played by Amitabh’s real-life wife Jaya Bhaduri, who here conceals in the folds of her white sari a round belly containing their son, Abhishek Bachchan, today a Bollywood star in his own right.) In the course of scouting the surroundings and waiting for their opportunity to take out the vicious Gabbar Singh, Jai and Veeru warm to the charms of village life and contemplate ending their run of adventures, heists, and jailbreaks in favor of settling down in peace. But first, there is business to attend to – the business of besting Gabbar Singh at his own violent game. The result is a film with a leisurely pace, appropriate to the sweeping backdrop in which the hot sun bakes the desert dry. Rounding out the film’s generous 200 minutes are five of the most delightful film songs I have ever seen. From the raucous buddy number, “Yeh dosti,” in which Amitabh and Dharmendra hold hands on a motorcycle, to the famous “Jab tak hai jaan,” in which the spunky and defiant Basanti dances barefoot on broken glass in hopes of preserving Veeru’s life, the songs do not let up for a moment. There is even a slinky nighttime number by the legendary Bollywood dancer known as Helen, who during her illustrious career performed sensuous, outrageously-costumed numbers in hundreds of Hindi films. Sholay may be an unconventional choice as a first Bollywood film – my virtual friends over at BollyWHAT?’s discussion board tend to introduce their friends to Hindi cinema by way of the modern weepies with their dreamy romance and big-time production numbers. 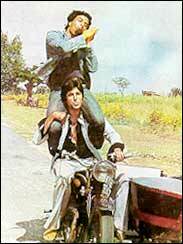 But I think Sholay is a perfect entrée to the best that Hindi film has to offer, especially to a Western audience that may be skeptical that song-and-dance has any place in a movie brimming over with guns and criminals and grand themes of violence and vengeance. 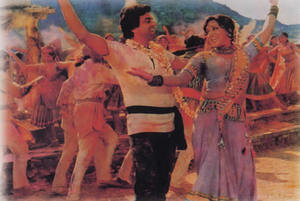 There is a reason this film is a classic; it is among the best ever to come out of the Bombay film industry. It’s readily available from services like NetFlix, or at your local masala shop. Go see it – a billion Indians can’t be wrong. होली के दिन दिल खिल जाते हैं रंगों में रंग मिल जाते हैं!